A community in Northern Illinois has come together to build the largest outdoor synthetic ice rink in the world. Harris Winter Wonderland is located in Rockford, Illinois - just over an hour Northwest of Chicago. 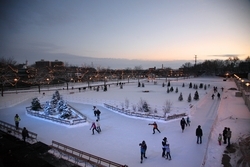 Harris Winter Wonderland is not only a family-friendly venue for people to enjoy outdoor ice skating along the banks of the Rock River, but it’s a story of community collaboration and pride. The ice skating surface is 12,000 square feet and includes an 800-foot trail around the park. The entire project - from the first idea to opening night - took just 8 short weeks to complete. The Rockford Area Venues and Entertainment Board wanted to put an unused park during the winter months in downtown Rockford to good use. It didn’t take long for both public and private entities to jump on board. To top it off - members of 13 local unions willingly gave of their time and braved the cold to build the rink and transform the park. The total value of the project is estimated at $350,000, but thanks to community collaboration and sponsors - it was done with no cost to the taxpayer. In the spirit of the holidays, a community came together to give a gift to itself. Now families can create some lasting memories. “This is about coming together for the benefit of our residents and the communities around us that want to share in the enjoyment and spirit of hope and partnerships,” said Mike Dunn, RAVE Board Chairman. In the spirit of the holidays, a community in Northern Illinois has come together to give a gift to itself: the world’s largest outdoor synthetic ice rink. Harris Winter Wonderland came together in eight short weeks. The actual construction of the rink took place over four days thanks to the hard work of volunteer union laborers, Rockford Park District workers and Rockford arena workers. They braved the cold (in weather in the single digits!) to transform the empty downtown Davis Park into the Harris Winter Wonderland complete with the ice skating surface, benches, evergreen trees, fire pit and hundreds of twinkling lights. The total value of the project is estimated at $350,000, but thanks to community collaboration and sponsors, it was built at no cost to the taxpayers. What makes this venue unique is the 12,000-square-feet of synthetic ice, which includes an 800-foot skating trail around the park. Synthetic ice is widely used around the world, but no one has attempted a rink of this size outdoors – until now. Synthetic ice is great for beginners and children, and it can be used whether it’s 10 degrees or 90. The synthetic ice rink was designed by KwikRink in cooperation with Quadrant. Their rinks have been used extensively for professional hockey, figure skating, and a variety of applications throughout North America, Europe, Asia, Australia and the Caribbean region. KwikRink President Don Mason said, “I’ve been in this business for 15 years and this is the most unique application of this product that I’ve seen.” Any and all skating techniques can be done on this surface and maintenance is minimal compared to natural ice. “We are dedicated to providing affordable, family-friendly entertainment options in our region,” said Rockford Area Venues & Entertainment (RAVE) Board Chairman Mike Dunn. This is just one of a few activities spearheaded by RAVE to provide no- and low-cost family activities to a community that has struggled with high unemployment. “This is about coming together for the benefit of our residents and the communities around us that want to share in the enjoyment and spirit of hope and partnerships,” he said. "Improving the quality of life in the areas we serve -- that's what Harris' community involvement is all about, so we jumped at the chance to help bring a venue like the Harris Winter Wonderland to Rockford as an affordable, accessible option for family fun," said Andrea Ward, Rockford Regional President, Harris Bank. "As members of the local community, it’s inspiring for us at Harris to be a part of this historic moment for Rockford – and for the world." RAVE had a vision to bring an outdoor skating experience to Davis Park and it was joined by the Rockford Park District, Harris, Northwestern Illinois Building and Construction Trades Council, Project First Rate, Professional Graphics Inc. and Lonnie’s CarpetMax to partner with RAVE and SMG to bring this dream to life. “This project demonstrates how successful we can be through partnerships and collaborations. We are so pleased that Davis Park is a destination not only in the summer, but also this winter where people of all ages can enjoy the outdoors participating in a fun and healthy activity,” said Rockford Park District Deputy Director of Operations Jay Sandine. “It’s great to see people coming from miles around to enjoy a fun family activity,” he continued. Harris Winter Wonderland will be open during December and January. Regular hours are Tuesday evenings from 5:30 to 7:30 p.m., Fridays from 6:00 to 10:00 p.m. Saturdays from 4:00 to 10:00 p.m. and Sundays from 2:00 to 6:00 p.m. There will be special holiday break hours from December 20 to 30. Holiday break hours will be Mondays through Thursdays from 4:00 to 8:00 p.m. and Sunday from 2:00 to 6:00 p.m. The rink will be closed on Christmas Eve and Christmas Day. Admission to skate is $3 and skate rental is $2. Harris is an integrated financial service organization providing more than 1.3 million personal, business and corporate clients with banking, lending, investing and wealth management solutions. The organization is a member of the BMO Financial Group (NYSE, TSX: BMO), which also provides corporate and investment banking services in the U.S. under the BMO Capital Markets name. The Rockford Area Venues and Entertainment Authority is the board that oversees the downtown arena and Davis Park, with the mission of revitalizing downtown entertainment. The board was appointed by Mayor Morrissey and Chairman Christiansen in March 2010. Find us on Facebook! Search Rockford R.A.V.E. and Harris Winter Wonderland.